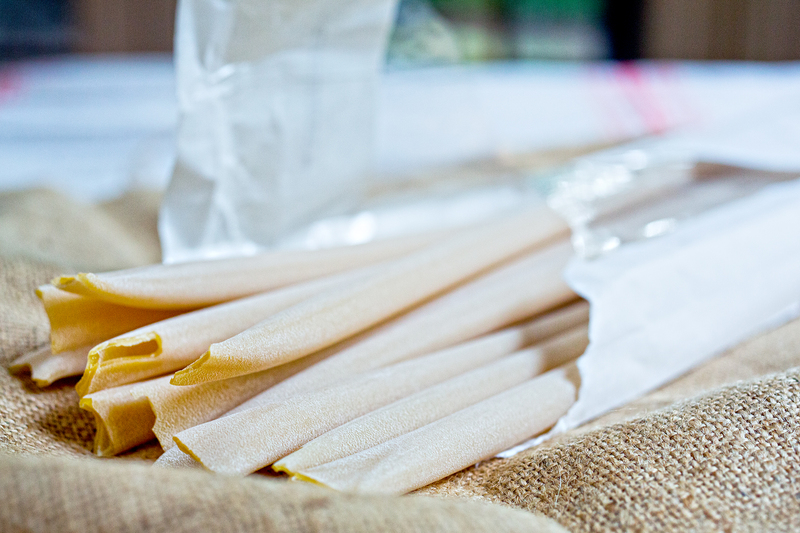 The length of the pasta has no bearing whatsoever on the length of your… um, shoes. Wow – this dish. It all started with the weird pasta. I was at Central Market (a sorta Whole Foodsie place in Texas) and I saw this pasta that was like 2 feet long called Candele Lunghe. Wow. Doesn’t THAT look like fun? I had these magical intentions of creating a beautiful pasta coil adorned with some beautiful meat and sauce combination, all perfectly garnished, etc, etc. Such are the musings of a food blogger. In practical application? Eeeehhhooooffff. I do not own a pasta pot that’s 2 feet tall. I don’t even own a baking dish that’s 2 feet long that I could try to like… well you get my conundrum. Then, I thought that I could just put them in there, sticking all out of the pot, and once the bottoms got soft kind of push the rest of it down. This did not work. I ended up just breaking the pasta up into smaller pieces. It kind of defeats the purpose of buying the long pasta in the first place, but I’m sure Italians and pasta snobs alike will tell you there is a textural difference. Maybe there is. Even so, next time I’m using rigatoni. At any rate, in figuring out what to do with this pasta, I, of course, stumbled upon a bunch of recipes. In Italian. Thank you, Google translate. 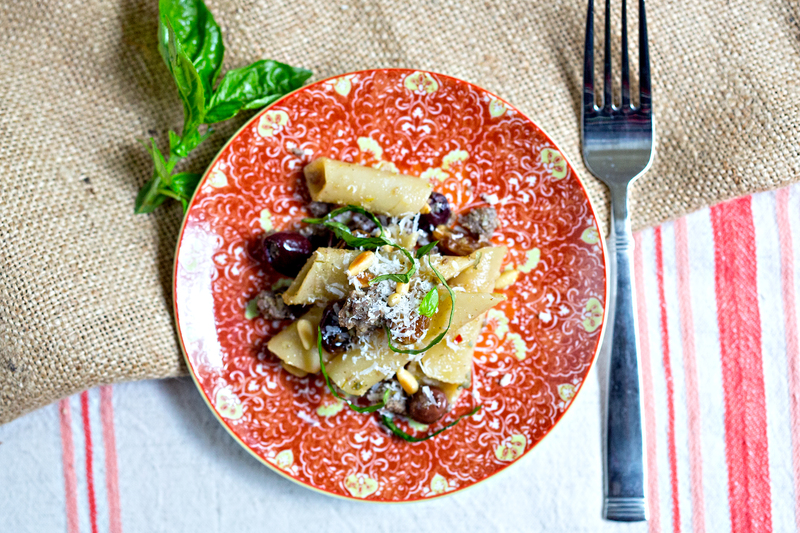 I kept finding more and more that involved a sweet/savory application, namely with plumped up raisins and anchovies. After that, I kind of mottled together a bunch of different recipes with what I had in my pantry. The result did, in fact, end up being magical. The sweetness of the grapes cut right through the salty anchovies and capers. Magnifico! The other awesome part about this dish, besides the fact that it’s freaking delicious and fancy, is that it comes together in a SNAP! You pretty much boil the pasta and cook the meat at the same time. Drain the meat, and while the anchovies and garlic are cooking in the fat, you can combine everything else. Then simply use my little secret I do with olive oil sauces, which is holding them over something steaming. It warms everything together just enough to meld the flavors. This dish would be great if you’re hosting a very adult dinner party. Break the candele lunghe (if using) into pieces and boil in salted water until al dente, about 8 minutes. Drain, leaving the hot pasta water in the pot if possible. Meanwhile, brown the sausage in a sauté pan. Remove from the pan to a paper towel to drain, leaving about 1-2 tablespoons of fat in the pan. Fry the anchovies, anchovy paste, and garlic in the fat until fragrant, 2-3 minutes. Remove from heat. 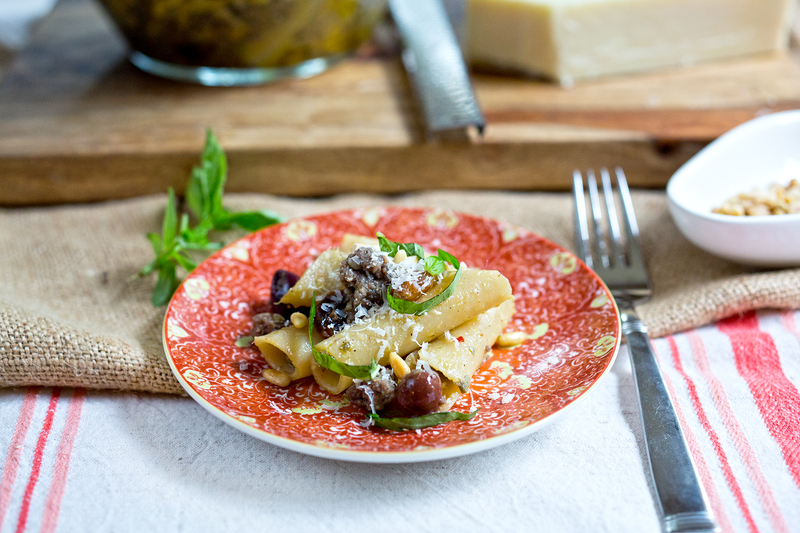 In a large bowl, combine the garlic/anchovy mix, drained reconstituted raisins, drained pasta, lemon zest and juice, capers, pine nuts, olive oil and olives. Hold over either the still-steaming pasta water or the warm stovetop just enough to lightly warm the oil but not cook it. Toss well, garnish with more cheese and basil and serve immediately. Vegetarian Substitution: This can easily be made without the sausage and anchovies, just make sure to find good salt-brined olives to use instead so you still get that sweet/salty thing.